A UK-made system of screw-together components comprising a push-on lens attachment with an internal threaded retaining ring which would allow the fitting of a combination of close-up lens, contrast filter and lens hood in one assembly. Whilst no doubt more stable than a series of push-on filters and lens hood like the Kodisk accessories, it must have been a cumbersome system to use in the field, especially when compared to modern equivalents. Shown above, centre left to right, are the Lens Attachment, which pushes onto the front of the lens and has a threaded retaining ring if only a single filter or close-up lens is to be used. The Coupling Ring which allowed the fitting of more than one filter, this replaces the retaining ring in the Lens Attachment. Finally the Lens Hood which screws into either. Shown top and bottom are red, green and cloud (yellow) filters and a 'Portra' close-up lens. These are all unthreaded and are held in place by the threaded components of the system. 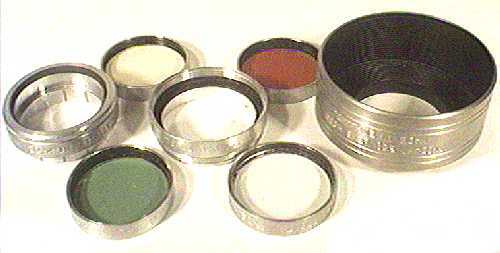 A UK-made system of push-on accessories such as close-up or "portrait" lenses, "Cloud" and contrast filters (for black and white), haze filters and lens hoods. These were manufactured in a number of sizes to suit different cameras, eg: a Size No 320 Lenshood fits a camera lens with a 32mm push-on fitting, though the "claws" that grip the lens are slightly adjustable, plus or minus a millimetre or so. The components are stackable, so one can first fit a filter to the camera and then a lenshood to the filter. The lenses and filters were supplied in transparent plastic screw-lock containers. Some of my boxed accessories have original price tags, a Size 320 "Cloud Filter" for example cost 13/5d, about 68p or $1 in todays currency. This would have equated to the cost of two or three rolls of black and white film and probably goes some way to explaining the relative scarcity of these items today.